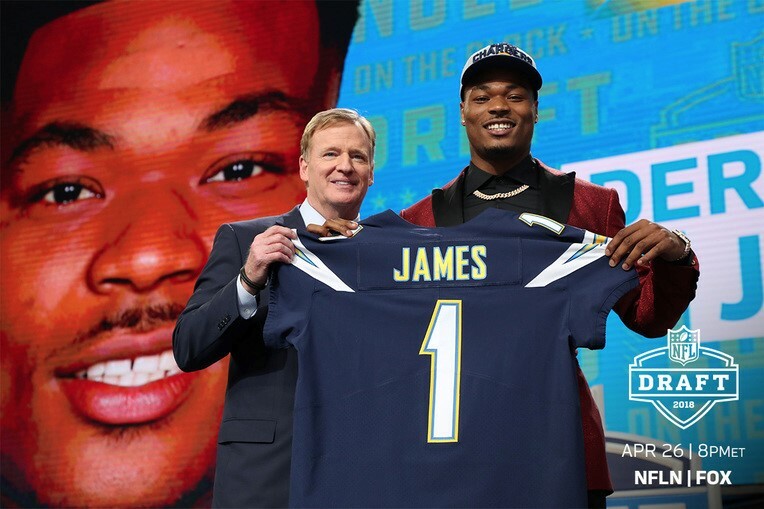 TALLAHASSEE, Fla. – Florida State defensive back Derwin James was selected by the Los Angeles Chargers with the 17th overall pick in the first round of the NFL Draft on Thursday. James’ selection marks the 35th straight NFL Draft with at least one Seminole selected, a streak that began in 1984, and makes him the 31st defensive back drafted from Florida State in the last 30 years. He is the 44th first-round selection and the 280th overall pick from Florida State. He also is the 23rd first-round pick from Florida State since 2000, and his selection marks the 13th NFL Draft in that time span with at least one FSU player taken in the first round. The 2018 NFL Draft continues Friday with rounds two and three. Coverage begins at 7 p.m. on ESPN, NFL Network and FOX before switching from ESPN to ESPN2 at 8 p.m. For up-to-the-minute updates on FSU’s draft picks, follow @FSUFootball on Twitter and Instagram or visit Seminoles.com.